Runnymede Park in the Town of Herndon is a natural haven of forest, marsh and meadow with many trails, some paved, on Herndon Parkway north of Elden Street. 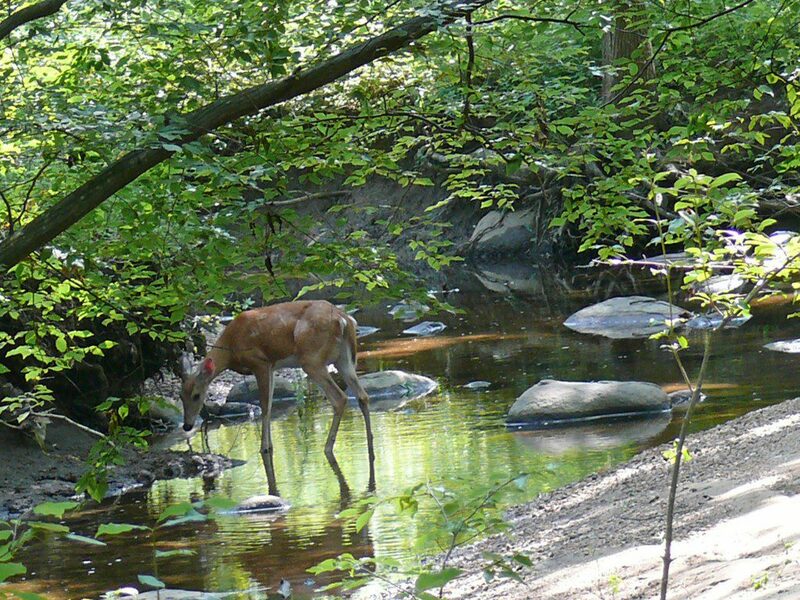 It covers 58 acres along Sugarland Run, a Potomac River tributary named for sugar maple trees that were tapped by Dogue Indians and early settlers. It lies within the Triassic Basin, on diabase rocks that are exposed in places by the stream. The Town of Herndon purchased the land in 1973, 1987 & 1988 and named it for Herndon’s sister city in England. Then it took three more years to settle what to do with the park, with VNPS’s Ann Csonka (now deceased) and her husband, John DeNoyer, championing the ultimately successful “Keep Runnymede Natural” campaign. In March, 1993, a major diesel oil spill down Sugarland Run wiped out muskrats, beavers, and aquatic life, leading to permanent changes in the landscape. The stream has since recovered with excellent fish diversity found in the annual sampling done by the Virginia Department of Game and Inland Fisheries and the reestablishment of beaver families in the park. Two picnic shelters and an expanded parking lot and interpretive garden were added in 2006 and a chimney swift tower was erected at the park entrance in 2013. Many people have botanized at Runnymede, including (but not limited to!) Ann Csonka, John DeNoyer, Meghan T. First, Cris Fleming, Gary Fleming, Joe Metzger, Stan Shetler, Craig Tufts, and Rod Simmons. They have found a total of over 450 native species of vascular plants in the park. The largest portion of Runnymede Park is wooded stream floodplain in which a iverse canopy of northern red oak, (Quercus rubra), white oak, (Q. alba), swamp white oak, (Q. bicolor), black walnut, (Juglans nigra), tulip tree, (Liriodendron tulipifera), pignut hickory, (Carya glabra), mockernut hickory (C. tomentosa), sweet pignut hickory, (C. ovalis), red maple, (Acer rubrum), black willow, (Salix nigra), white ash, (Fraxinus americana), green ash, (Fraxinus pensylvanica), sycamore, (Platanus occidentalis), hackberry, (Celtis occidentalis), persimmon, (Diospyros virginiana) and box elder, (Acer negundo), shelters an understory of hornbeam, (Carpinus caroliniana), flowering dogwood, (Cornus florida), blackhaw, (Viburnum prunifolium), fringetree, (Chionanthus virginicus), hazelnut, (Corylus americanus), pawpaw, (Asimina triloba), shadbush, (Amelanchier sp. ), American holly, (Ilex opaca), and bladdernut, (Staphylea trifolia). Shrubs include pasture rose, (Rosa carolina), spicebush, (Lindera benzoin), arrowwood, (Viburnum dentatum), hearts-a-burstin,’ (Euonymus americana), and winterberry, (Ilex verticillata), along with invasive multiflora rose, (Rosa multiflora) and bush honeysuckle, (Lonicera maackii). The herb layer boasts the common jack-in-the-pulpit, (Arisaema trifolia), partridgeberry, (Mitchella repens), wild ginger, (Asarum candense), path rush, (Juncus tenuis), sensitive fern, (Onoclea sensibilis), lady fern, (Athyrium asplenioides) and the like, along with a wider than usual variety of sedges large, (Carex intumescens; C. squarrosa; C. lurida) and small, (C. debilis, C. rosea, C. radiata). A small cattail marsh, (Typha latifolia) edged with red-twig dogwood, (Corunus sericea) and buttonbush, (Cephalanthus occidentalis) invites a chorus of spring peepers. Bluebird boxes in the park maintained by volunteers house 10 to 20 new hatchlings each spring, and adults are often visible even in the winter. Moving just a few feet higher in elevation changes the vegetation dramatically. Here one finds Virginia pine, (Pinus virginiana), shortleaf pine, (Pinus echinata), Eastern red cedar, (Juniperus virginiana), bigtooth aspen, (Populus grandidentata), post oak, (Quercus stellata), black oak, (Q. velutina), and shingle oak, (Q. imbricaria); deerberry, (Vaccineum stamineum), bluets both common, (Houstonia caerulea) and summer, (H. purpurea); and a lovely meadow full of Indian grass, (Sorghastrum nutans), beaked panic grass, (Coleatania anceps), mountain mint, (Pycnanthemum tenuifolium), smooth beardtongue, (Penstemon laevigatus), lyreleaf sage, (Salvia lyrata), spiked lobelia, (Lobelia spicata), yellow star grass, (Hypoxis hirsuta) and more. 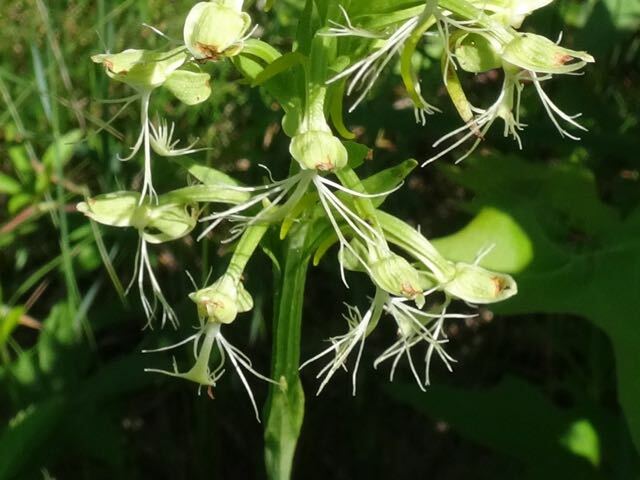 That’s where Jan Meyer photographed this green fringed orchid, (Platanthera lacera). Invasive removal efforts have been waged to maintain habitat for the remarkable native plant diversity, but many remain in the park, including; multi-flora rose, Japanese honeysuckle, oriental bittersweet, garlic mustard, autumn olive, Russian olive, Bradford pear, Japanese barberry, mile-a-minute vine, and Java dropwort.